Fridays at 7:44 a.m., 3:44 p.m. and 5:44 p.m. This Week In Oklahoma Politics is KOSU's weekly political news segment. Each week, KOSU's Michael Cross talks with ACLU Oklahoma Executive Director Ryan Kiesel and Republican political consultant Neva Hill about bills making their way through the legislative process and the latest news affecting Oklahoma citizens. 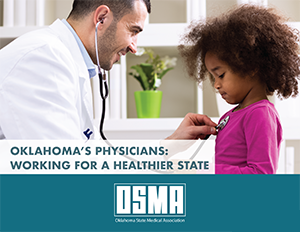 This Week in Oklahoma Politics is sponsored by the Oklahoma State Medical Association. whose 4,000 physician members are committed to better health for all Oklahomans. This Week in Oklahoma Politics, KOSU's Michael Cross talks with Republican Political Consultant Neva Hill and ACLU Oklahoma Executive Director Ryan Kiesel about the movement of the Ten Commandments monument of the State Capitol grounds and the news that the wrong drug was used in January to execute Charles Warner. The trio also discuss the overturned blackmail conviction of former Sooner Tea Party leader Al Gerhart, the upcoming vote by Oklahoma City banning all activity in medians and the impact of Real ID on Oklahomans. This Week in Oklahoma Politics, KOSU's Michael Cross holds a lengthy discussion with Republican Political Consultant Neva Hill and ACLU Oklahoma Executive Director Ryan Kiesel about the second stay of execution for Richard Glossip as well as the future of the Ten Commandments monument at the State Capitol. The trio also discuss a plan by former Senator and Governor David Boren for a one cent sales tax to fund education and agency heads warned by legislative leaders to be ready for deeper cuts. This Week in Oklahoma Politics, KOSU's Michael Cross talks with ACLU Oklahoma Executive Director Ryan Kiesel and Repulican Political Consultant Neva Hill about the visit to the Sooner State by GOP Presidential candidates Donald Trump and Carly Fiorina, along with the latest attempts by attorneys for Richard Glossip to prove his innocence. The trio also discuses three candidates looking to replace state Republican Party Chairman Randy Brogdon who resigned after just five months on the job and a bill possibly going before lawmakers next year to raise the pay of retired educators in an attempt to shore up the teacher shortage in the state. This Week in Oklahoma Politics, KOSU's Michael Cross talks with Republican Political Consultant Neva Hill and ACLU Oklahoma Executive Director Ryan Kiesel about the US Supreme Court ruling in favor of Affordable Care Act supporters, the Political Director of the state Republican Party resigns after pressure from GOP officials and Oklahoma City attorney Jerry Fent files a lawsuit challenging he upcoming state budget. The trio also discusses a successful petition seeking a grand jury investigation of Tulsa's sheriff, Oklahoma's Democratic Party considers the option to open its primaries to independent voters and racist pamphlets in the eastern Oklahoma town of Pryor. This is the season finale of This Week in Oklahoma Politics, Ryan and Neva are taking a break over the summer and will return in September.